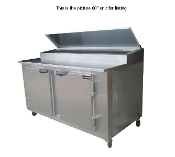 Our Products >> Cooltech 4 Door Refrigerated Pizza Prep Table 96"
Cooltech 4 Door Refrigerated Pizza Prep Table 96"
Durable stainless steel front, side, top and interior. Removable sealed and self-closing hinged door. Full-door opening can fit full-sized (18"W x26"D) sheet pans. Temperature control ranges from 32F to 39F. Made in USA. One year manufacturer's warranty on parts and compressor.